Max grew up on a potato farm in the small prairie town of Rice, Minnesota. Some of his first theater adventures took place in his best friend's basement, where he played Captain Hook and ran the fly rail. A couple years later he played a lost boy in a real theater, and he was never the same. He graduated from St. Olaf College with a degree in theater and a concentration in media studies. Since graduating, Max has worked with several theaters throughout the Twin Cities and around Minnesota. Max spent two seasons as a performing apprentice at the Children's Theatre Company in Minneapolis, the largest theater for children and families in North America and the only theater for young people to win the Regional Theatre Tony Award. Credits at CTC include How the Grinch Stole Christmas (2012, 2014, 2017, 2018); The Sneetches; Shrek; Cinderella (2009, 2013); The Wizard of Oz; The 500 Hats of Bartholomew Cubbins; Mr. McGee and the Biting Flea; Ramona Quimby; Romeo & Juliet (2009 Ivey Award winner for outstanding direction by Greg Banks); The Lion, the Witch, and the Wardrobe; Madeline and the Gypsies; The Magic Mrs. Piggle-Wiggle; Bud Not Buddy; and Alexander and the Terrible, Horrible, No Good, Very Bad Day. He also understudied productions of Average Family, A Year with Frog and Toad, If You Give a Mouse a Cookie, Bert and Ernie, Goodnight! and The Scarecrow and His Servant. Max created, produced and starred in Fruit Fly: The Musical, which premiered at the 2012 Minnesota Fringe Festival. The autobiographical musical, co-written with Sheena Janson Kelley, composer Michael Gruber and director Nikki Swoboda, was a hit with critics and audiences and was the #6 best-seller out of 163 at the festival. The show was further developed as a part of the Illusion Theater's Fresh Ink series, and received its full-length premiere there in the spring of 2015. His second musical, Shelly Bachberg Presents: How Helen Keller and Anne Frank Freed the Slaves: The Musical, premiered at the 2013 Minnesota Fringe, selling out three of its six performances and becoming the second-best-selling show out of 176 in the festival. That show's sequel, Shelly Bachberg Presents: Orange is the New POTUS: The Musical, was the seventh-best-selling show (out of 174) of the 2015 festival. Ball: A Musical Tribute To My Lost Testicle, the second-best selling show of 168 in the 2016 Festival, has toured throughout the Midwest and traveled to New York City in 2018 for United Solo, the world's largest solo theatre festival. Delgadina, a musical for young people inspired by a Chilean folktale, was awarded an Artist Initiative grant by the Minnesota State Arts Board and had its world premiere reading in early 2018, and Pansy, inspired by the gay underground cabaret movement of the 1930s, had its first workshop in the NEXT Festival at Theatre Latte Da in July 2018. Other theater credits include the Great River Shakespeare Festival (Cymbeline), Guthrie Theater (A Christmas Carol, Sunday in the Park with George, As You Like It), Nautilus Music-Theater (Carousel, Ordinary Days (2014 Ivey Award winner for overall excellence); readings of In Dreams Begin Responsibilities, Propeller, Ordinary Days, Cantata for Belarus, Kingdom Undone, Further Fidgety Fairy Tales, Fortuna the Time-Bender vs. The Schoolgirls of Doom, Beyond Fidgety Fairy Tales, Empire Builder, Dominic Argento's Letters from Composers, and ​Prairie Cantata), Skylark Opera (Lost in the Stars), Heritage Theatre (Urinetown), Paul Bunyan Playhouse (The Who's Tommy, The 25th Annual Putnam County Spelling Bee), Minneapolis Musical Theatre (Big River, Mame), Populus Theatre ((in) prov-i-dence), Pioneer Place on Fifth (Laughing All The Way, The Who's Tommy), Frank Theatre (Cabaret), Urban Samurai Productions (Musical: The Musical, [title of show]), Theater Latte Da (All Is Calm, C.; readings of C., Stu for Silverton, The Illyria Project, Gun and Powder, and Pansy), Workhouse Theatre Company (Torch Song Trilogy), The Strange Capers (Twelfth Night), Shadowplay Theatre (The Mousetrap), Tyrol Hills Music (Deal! The Musical), the Peanut Butter Factory (Joe Dowling's William Shakespeare's Romeo & Juliet on the Moon, featuring Kate Mulgrew as Lady Capulet), Park Square Theatre (Johnny Baseball, The Pirates of Penzance), Alan Berks & Company (Six Characters in Search of an Author), Second Fiddle Productions (readings of Little Women and 110 In The Shade), Ten Thousand Things (The Unsinkable Molly Brown, The Good Person of Szechwan), Illusion Theater (Fruit Fly; reading of A Gest of Robin Hood), the Jungle Theater (You Can't Take It With You), and LOFTrecital (Myths and Hymns). Max works as a soloist and section leader at Spirit of Hope United Methodist Church in Golden Valley under the direction of Jerry Rubino, as well as a freelance commercial actor, voice-over artist, playwright and lyricist. 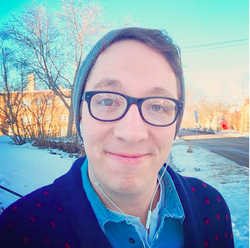 He has also taught with St. Olaf College, St. Cloud Civic Theater, Plymouth Playshop, Southeastern Summer Theatre Institute, Maple Grove High School, and Lakeville North High School. In November 2012, Max and fruit fly Sheena Janson Kelley began curating Musical Mondays, a monthly cabaret which showcases the best of the Twin Cities musical theater community and offers a casual and fun networking opportunity for area theater professionals.